full size Cartoon for the embroidery designed for Francis Horner. 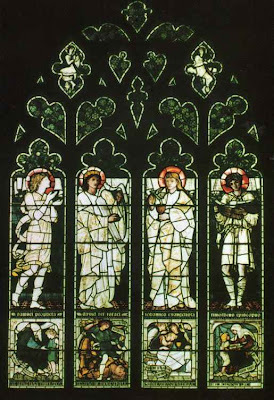 designed for Morris & Co.
produced by Burne-Jones and William Morris. Only finally completed after their deaths. 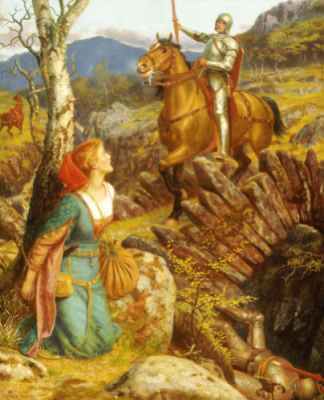 one of a series of pictures of the life of St George and the Princess Sabra, originally commissioned by Birket Foster for his house in Witley, Surrey. Looking at the colours here you can definately see one source of inspiration for the PRB. A design for a cabinet by Philip Webb. 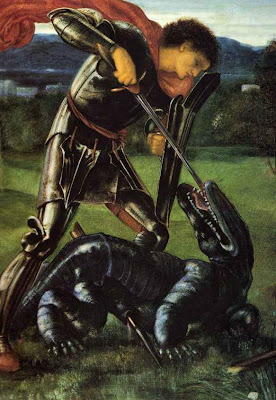 The story is from Chaucer's The Franklin's Tale. 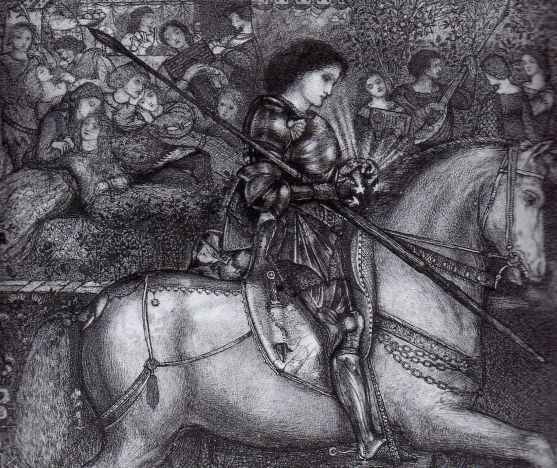 Burne Jones (and Morris) were great fans of Chaucer's poetry. 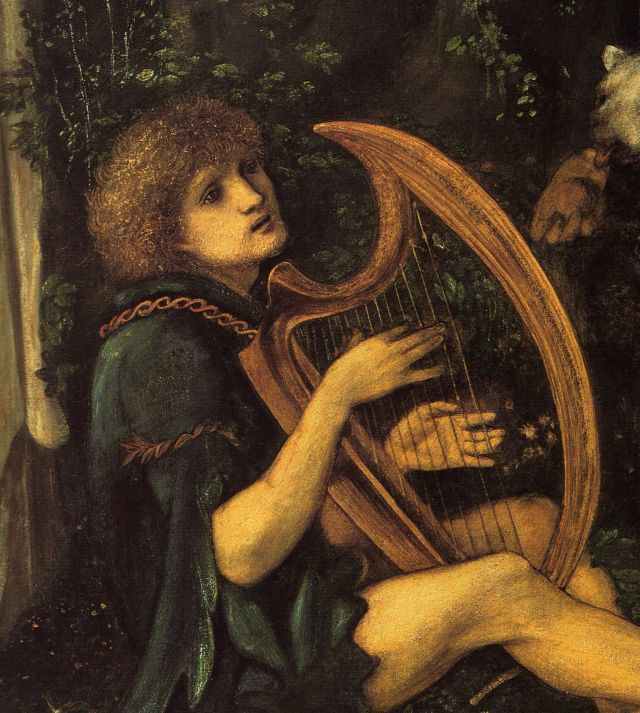 A favourite subject of Burne-Jones. 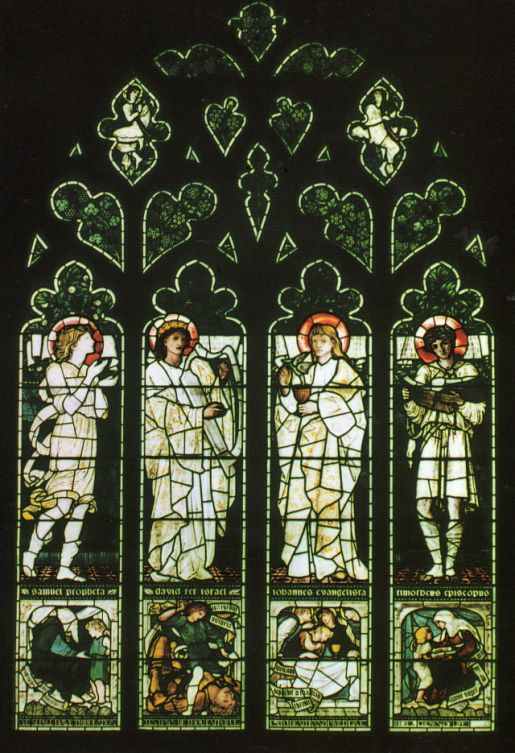 originally designed for a set of stained-glass windows commissioned by Walter Dunlop of Bradford. An early drawing related to Rossetti's watercolour Before the Battle. 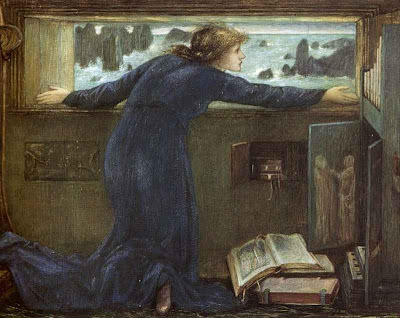 Olive Maxse was a young woman who served as Burne-Jones's model in the 1890s. 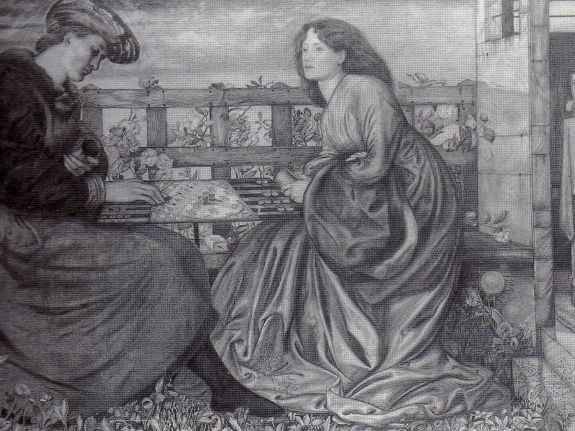 They became keen correspondents; in one letter, which illustrates their close relationship, Burne-Jones wrote: 'A certain kind of silly rubbish has always helped me, deep down, as we are all face to face with enough solemnity - we can guess that much of each other with certainty even if we know nothing - so I shall be silly till you want me to be sad and then you shall have all the sadness that is in me' (M. Harrison & B. Waters, Burne-Jones, New York, 1973, p. 161). 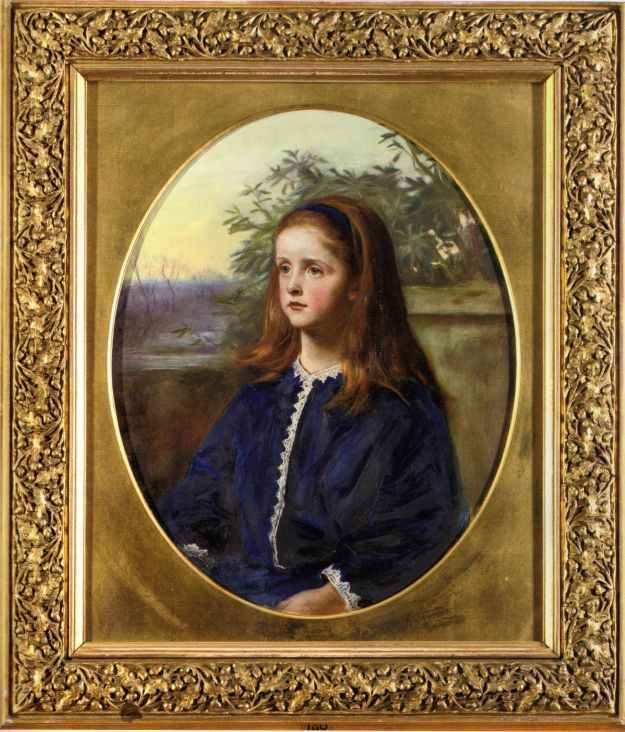 One of the four children of Frederick Augustus Maxse (1833-1900), a naval officer and radical, Olive grew up under the tutelage of a succession of governesses after her parents seperated in 1877. 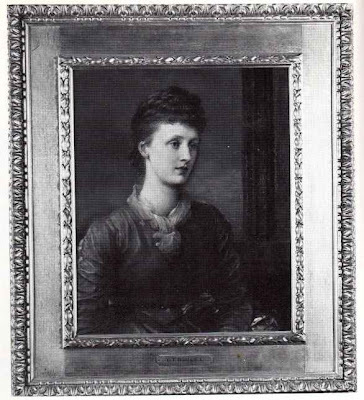 Her younger sister, Violet (1872-1958), first married Lord Edward Herbert Gascoyne-Cecil (1897-1918), and secondly Sir Alfred Milner, later Viscount Milner (1854-1925). Her brothers were Sir (Frederick) Ivor Maxse (1862-1958), who became a leading First World War general and Leopold James Maxse (1864-1932), who rose to fame as a prominent journalist, subsequently owning and editing the National Review. There are two similar portrait studies to the present drawing, and although the sitter is unknown in both, they bear a striking resemblance to our study. 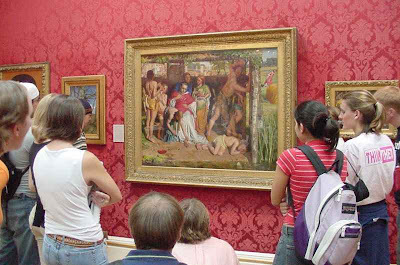 The first, in the Birmingham Museum and Art Gallery is dated 1895 and inscribed by the artist as being for The Sirens (Ringling Museum of Art, Sarasota, Florida), a picture begun in the 1870s but never completed. 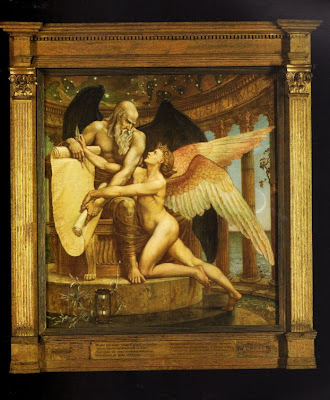 The second is dated and inscribed '1896/AVALON' identifying it as a study for one of the queens gathered around the dying hero in The Last Sleep of Arthur (1881-1898), now in the Museo de Arte at Ponce, Puerto Rico (see C. Wood, Burne-Jones, London, 1998, p. 126). Burne-Jones's admiration for Maxse was demonstrated when she mentioned to him that a number of her fellow students at the Académie Julian in Paris had suggested that her features resembled those of a Burne-Jones model. He replied: 'Those students at Julian's conceived a high ideal of me if they think they are at all like any heads I paint - I hope it's a little true - for I think you beautiful - and an old artist may tell a young girl that without hurt or blame - and when you come back I shall claim my privilege of drawing from you' (Harris & Waters, loc. cit.). Offered for sale at Christie's in June 2009 but seems to have not been sold. It was exhibited at the Society of Portrait Painters in 1896, the year of his death but seems to have been painted about 1864. 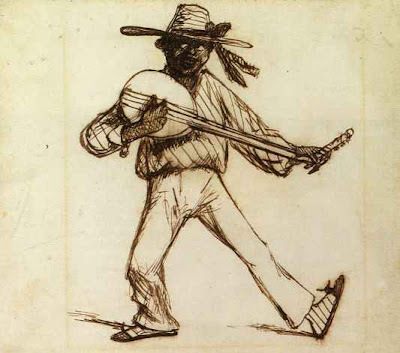 Henry Blackburn (ed. ), Grosvenor Notes 1882, London, 1882, p.16, illustrated. Athenaeum, no. 2845, 6 May 1882, p.576. 'The Work of Walter Crane', with notes by the artist, Easter Art Annual (extra number of the Art Journal), London, 1898, p. 25. 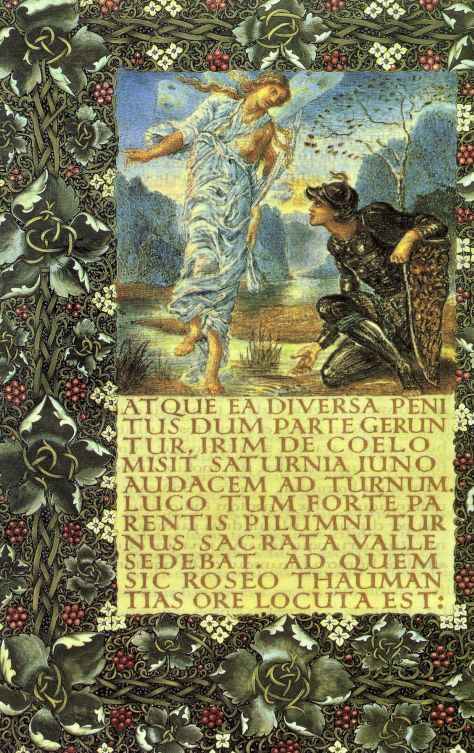 Gustave Soulier, 'Walter Crane', Art et Décoration, Paris, December 1898, p.169, illustrated. P.G. Konody, The Art of Walter Crane, London, 1902, pp. 96, illustrated opposite 134. Otto von Schleinitz, Walter Crane (Kunstler-Monographien, no. LXII), Beilefeld and Leipzig, 1902, pp. 57-8. 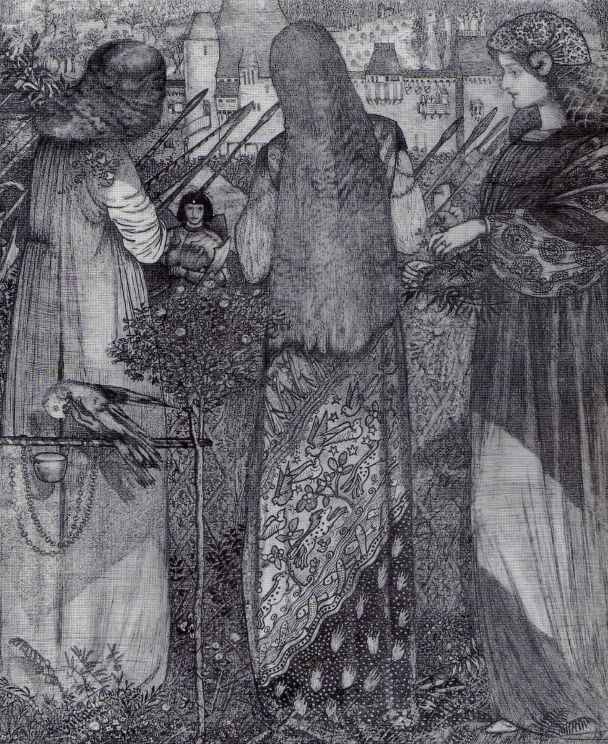 Walter Crane, An Artist's Reminiscences, London, 1907, pp. 230-1, illustrated. 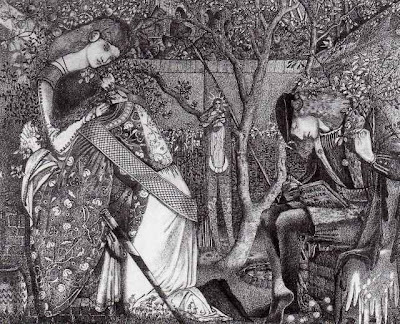 Isobel Spencer, Walter Crane, New York, 1975, pp.123, 126 (illustrated), 127. 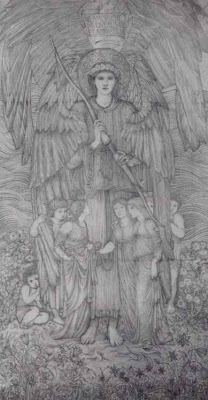 Exhibited at the Grosvenor Gallery in 1882 when the artist was thirty-six, the picture shows an angel attempting to alter the course of events by preventing Time from unrolling the scroll on which the destiny of mankind is recorded. It illustrates two verses from Edward FitzGerald's translation of the Rubáiyát of Omar Khayyám, which were printed in the Grosvenor catalogue. 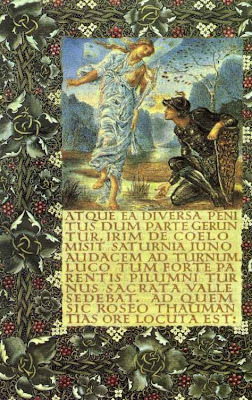 Like so many members of the Pre-Raphaelite circle, Crane was a great admirer of this poem, which he had first encountered when visiting Burne-Jones in the 1870s; he had seen a manuscript version, now in the British Library, which had been written by William Morris for Georgiana Burne-Jones and illuminated with figures designed by Burne-Jones and executed by Fairfax Murray. About the same time that he painted The Roll of Fate he used the poem as an iconographical source for a scheme of lacquered gesso reliefs in the dining-room at 1 Holland Park, his contribution to the great Aesthetic interior created by Alexander Ionides, the Greek Consul-General in London, at this north Kensington mansion. The picture's subject was inspired by two bereavements that Crane suffered early in 1881, the death of his fourth infant child, a son, in January, followed by that of his sister Lucy in May. In his autobiography, Crane describes how he and his wife were so distressed by the death of their child that they left London, settling during the spring of 1882 at Wickhurst, an old manor house 'on the side of a hill overlooking Seveanoaks Weald'. It was there that he painted The Roll of Fate. 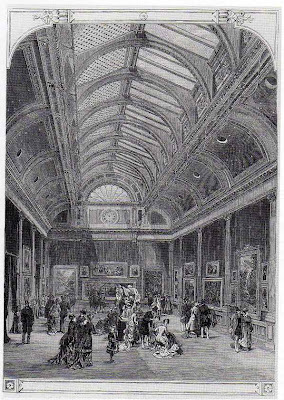 F. G. Stephens, reviewing the Grosvenor exhibition in the Athenaeum, described the picture as 'a quaint but somewhat clumsy Renaissance allegory of Time enthroned within his temple'. He liked the angel, 'a noble and manly figure, whose limbs are well drawn and modelled', but felt that Time was 'a poor conception' while the 'design in general' was 'an anachronism'. The painting was one of the first of the later works in which Crane gave free rein to his fondness for allegory. 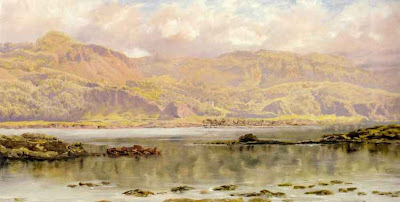 He returned to this area of subject matter in The Bridge of Life, exhibited at the Grosvenor in 1884 and sold at Christie's, London on 30 March 1990 (lot 512); and he continued to explore it almost until the end of his life. The Roll of Fate was bought by Somerset Beaumont, a wealthy landowner and sometime member of parliament for Wakefield who was a loyal patron of Crane from the early 1870s. He was the brother-in-law of the Rev. Stopford Brooke, the well-known preacher of Broad Church views who also owned many examples of Crane's work. In general, however, these allegorical pictures were less appreciated in England than they were in Germany. As Crane himself observed, 'possibly, apart from any artistic quality, the symbolic and figurative character of their subjects (was) more in keeping with the Teutonic mind'. The most consistent collector of these paintings was Ernst Seeger of Berlin, who owned, among others, The Bridge of Life and The Chariots of the Hours, a Wagnerian composition that won a gold medal at the Glass Palace Exhibition at Munich in 1895. This is now lost, but many of Crane's paintings that found homes in Germany are now in German public collections. They include Neptune's Horses (1893; Munich), The Mower (1901; Karlsruhe), and A Masque of the Four Seasons (1905-9; Darmstadt). 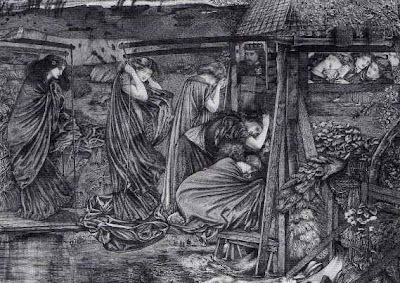 The present picture is a compositional sketch for one of J W Waterhouse's most intriguing paintings, The Magic Circle (1886). Now in the permanent collection of Tate, the larger, signed version was so well received at the Royal Academy's Summer Exhibition of 1886 that it was purchased for the nation by a committee of Academicians using funds from the Chantrey Bequest. 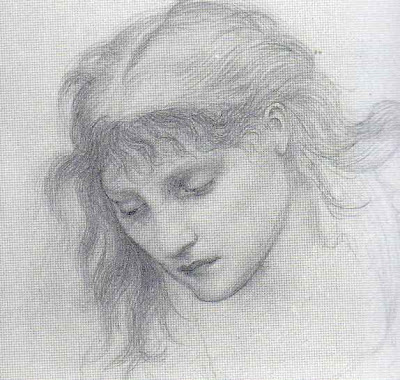 The fact that Waterhouse worked up this preparatory sketch in such detail underscores how seriously he viewed the 'final' canvas, the first he exhibited after his election to the rank of Associate in the Academy in June 1885. 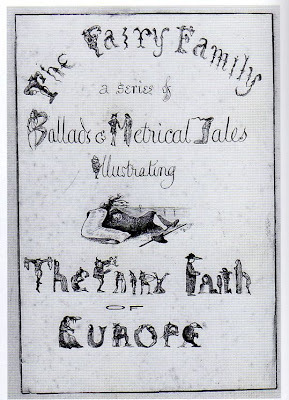 The artist had considered this occultist motif since at least 1881, when he exhibited a sepia drawing of a somewhat less agitated-looking witch at London's Dudley Gallery (private collection). The Magic Circle was Waterhouse's third supernaturally themed exhibit in three years, coming after Consulting the Oracle and St. Eulalia (both now at Tate). In the present version and in Tate's, a sorceress with a flushed face traces a circle in an ambiguous moonlit locale defined by rocky cliffs, on top of which appear several Egyptian-looking structures, probably tombs. Watched from a safe distance by three people gathered before a lamp-lit cave that hints at the underworld, the chanting witch draws a magic circle with a cold fire of blue and yellow dabs, distinct from the hot central fire of orange, violet, and green strokes. 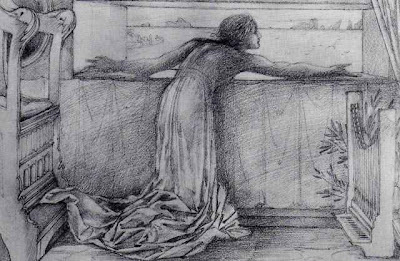 This sketch is noticeably duskier than the final version; it is likely that Waterhouse decided to lighten his palette so that the scene could be more easily discerned in the crowded, unevenly lit Academy. Bloated white poppies underscore the hallucinatory atmosphere inside the circle, which is anchored by the magical triangle formed by the sorceress's body and wand. 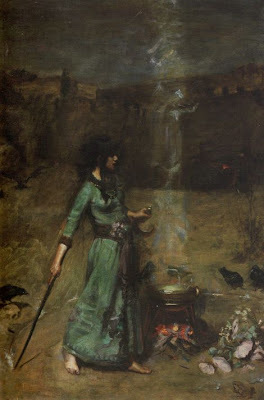 In her left hand, shaped like a crescent moon, is a boline, used by Celtic Druids and witches to cut herbs, which are shown gathered at her waist. 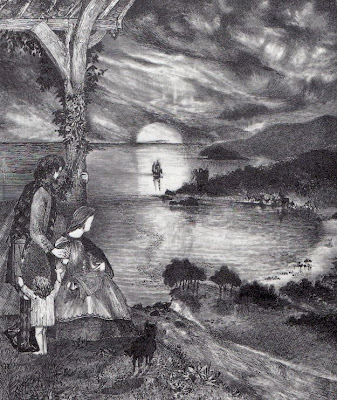 The boline hints at the growing enthusiasm for Celtic lore in the 1880s; it was widely believed that Celtic priests 'shape-shifted' into animals and trees. Ever eclectic, Waterhouse decorated the skirt not with a Celtic pattern, but with an Archaic Greek warrior encountering a serpent, perhaps Jason using Medea's potion to drug the one that protected the golden fleece. While one black raven perches on a human skull, another prepares to land. Arranged in a rough semicircle, a total of seven such birds watch the sorceress; this magical number and shape are identical to those of the women in Waterhouse's Consulting the Oracle (Tate) two years earlier, and his famous Hylas and the Nymphs (Manchester Art Gallery) a decade later. The toad in the right foreground may be an omen, yet it is worth noting that one of the herbs prominent here is angelica, which carries positive healing associations rather than poisonous ones. It is, therefore, just possible that the sorceress has drawn a circle to counter-rather than aid-the ominous creatures watching her beyond it. 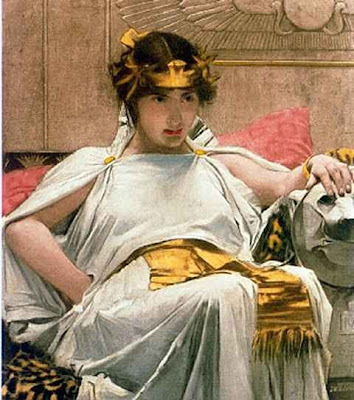 Viewers would have immediately associated Waterhouse's jet-haired sorceress with the acclaimed Medea exhibited by Frederick Sandys (1829-1904) at the Academy in 1869, and then at the 1878 Exposition Universelle in Paris. 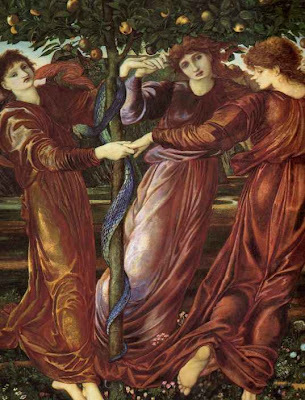 Sandys's is just one of several Pre-Raphaelite images that might have inspired Waterhouse, including Burne-Jones's The Magic Circle (c. 1880) and Rossetti's vision of Jane Morris as Astarte Syriaca (1877), the powerful Near Eastern goddess of love and the moon, whose symbol was fire. 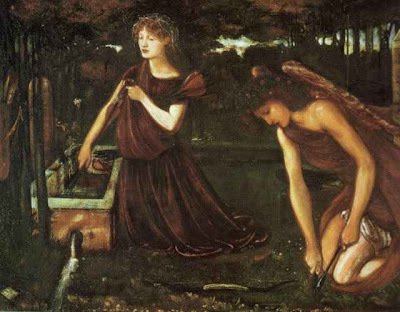 Beyond updating a type, this picture reflects Waterhouse's growing interest in occultism. The widespread perception that women made better mediums for supernatural communication gave them a degree of influence unimaginable in conventional religion. 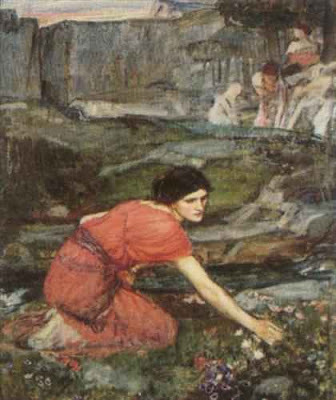 Describing this sorceress as engaged in 'a fearful secrecy with nature', Waterhouse's biographer Rose E.D. 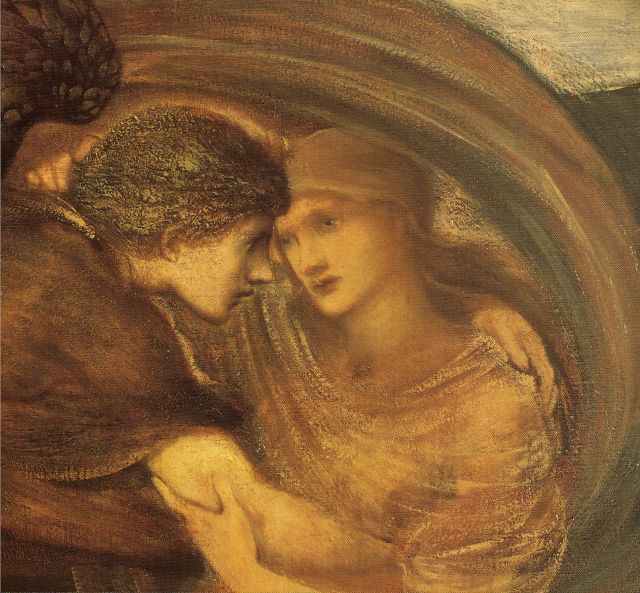 Sketchley wrote in 1909 that The Magic Circle 'belongs more closely to the artist himself. 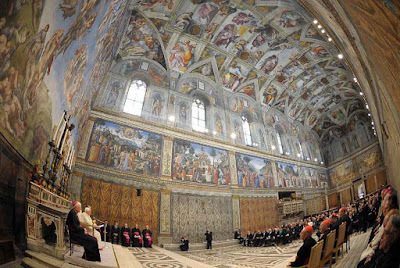 The picture denotes the attitude in which occultism is founded; the intensified sense of the power of the will, of its influence, seeing that is allied with them, over forces of destruction and renewal in the natural world'. 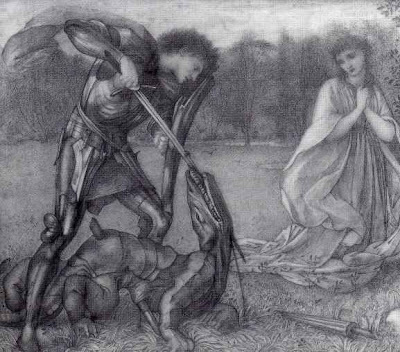 Published with Waterhouse's approval, Sketchley's interpretation increases the likelihood that the snake coiled round the sorceress's neck represents the ouroboros, the great serpent that encircles earth and symbolizes the cycle of life and death. The ouroboros was promoted by the internationally controversial Helena Blavatsky (1831-1891), co-founder of the Theosophical Society, whose teachings encompassed reincarnation and the evolution of magical and archaic symbols in world religions. Many spiritualists used séances to encounter ectoplasm, which Waterhouse suggests with amorphously brushed patterns within the column of smoke. In these varied ways, The Magic Circle offers suggestive hints that Waterhouse inclined towards occultism. We cannot be certain of his intention, but we are certain that he returned to images of sorceresses and ceremonial magic through the rest of his career. 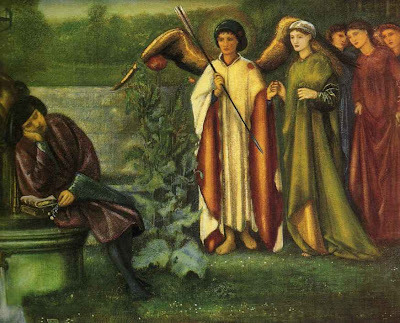 Setting aside his personal beliefs, The Magic Circle exemplifies Waterhouse's growing theatricality. The Academy observed that, 'the subject is an intensely dramatic one', and the caricaturist Harry Furniss concurred by providing Punch with a spoof of The Magic Circle showing Sarah Bernhardt stirring a cauldron with a giant spoon as a rat and theatre audience watch. One of the most famous people in the world during the 1880s, Bernhardt was known to attend séances and sleep in a coffin, and Waterhouse may have seen her 1879 exhibition in London which included the bas-relief she sculpted of herself, classically draped and open-mouthed, striding to crown busts of Shakespeare and Moliere. 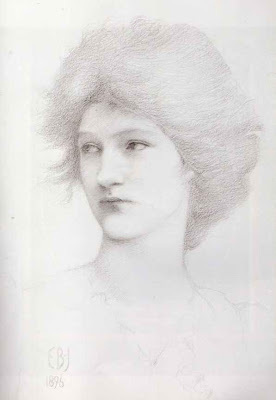 Furniss's association was further encouraged by the distinctive nose and unruly hair of Waterhouse's sorceress, which evoke Bernhardt's profile. Waterhouse's painting technique here is also worthy of note. He and many other British artists had absorbed Impressionism not directly from Monet or Renoir, but as filtered through the Anglophilic French painter Jules Bastien-Lepage (1848-1884). The Magic Circle represents Waterhouse's earliest known experimentation with several of Bastien's strategies. Most obvious are changes in the consistency of paint and its application to suggest spatial recession and draw attention to the figure. Note, for example, the contrast between the scratchlike kindling in the hot fire and the thickly painted, virtually photographic forearm and feet of the sorceress. Behind her, Waterhouse emulated Bastien's grey and umber scenery, painted thinly and freely with a square brush. 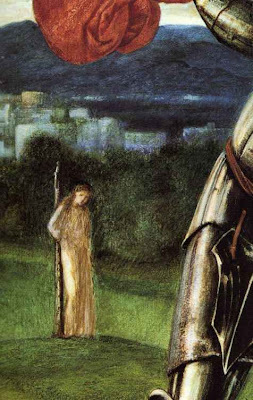 Together, the foreground and background 'dissolve' to enhance the sorceress's dramatic presence. 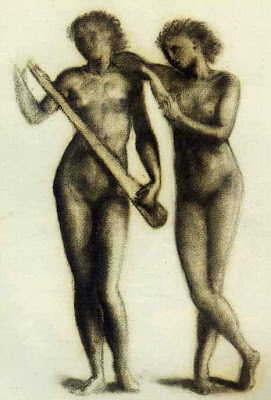 This technique was readily found in the annual exhibitions of the New English Art Club, a group of younger, French-influenced artists who formed in 1886, the very year The Magic Circle appeared at the more conservative Academy. 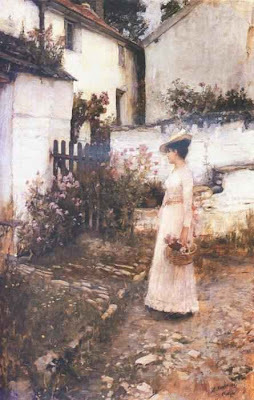 Waterhouse's capacity to employ leading-edge techniques in a seemingly conventional composition marked him out, then as now, as a talent worth watching. We are grateful to Peter Trippi for his help in preparing this catalogue entry. 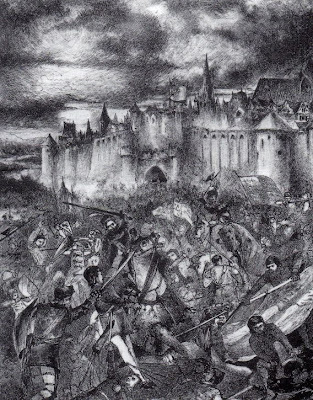 Burne-Jone's first commission (whilst he was still at Oxford University) but the actual illustrations were not published till the 1985 edition! 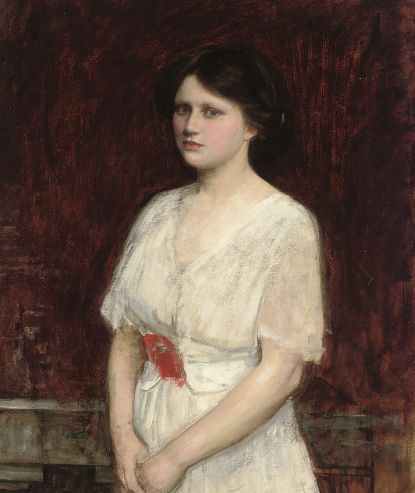 Claire Kenworthy was the artist's niece by marriage. From the Collection of L.S. 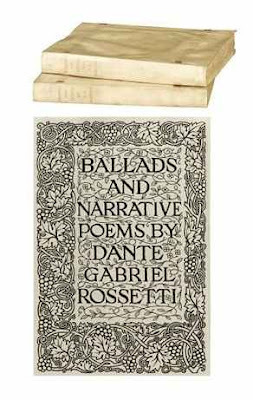 Lowry, R.A.
V. Surtees, The Paintings and Drawings of Dante Gabriel Rossetti: A Catalogue Raisonné, Oxford, 1971, vol. I, p. 173, no. 354; vol. II, pl. 404. Annie Miller (1835-1925) was a girl of striking appearance and easy virtue who came from humble origins in a Chelsea slum. 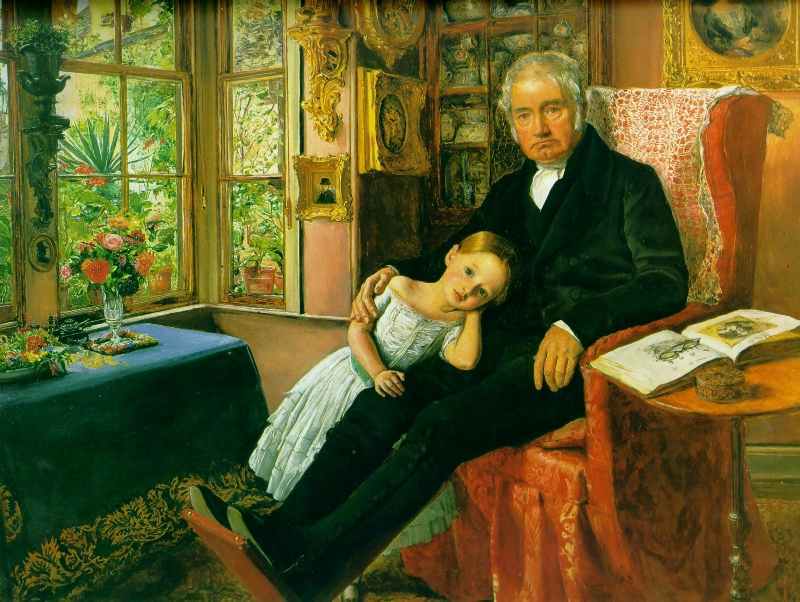 She sat to Holman Hunt for his Awakening Conscience (Tate Gallery), exhibitied at the Royal Academy in 1854, and he hoped to marry her when she had learnt to write and conduct herself in a ladylike manner. Before he left for the Holy Land in January 1854, he paid for her education and gave her a list of artists for whom she could sit. It did not include Rossetti, but she disregarded Hunt's instructions and was often Rossetti's model during the ensuing years, posing, among others, for Dante's Dream (1856; Tate Gallery), Cassandra (1861; British Museum), and Helen of Troy (1863; Kunsthalle, Hamburg). Virginia Surtees also lists six independent studies, including the present drawing. 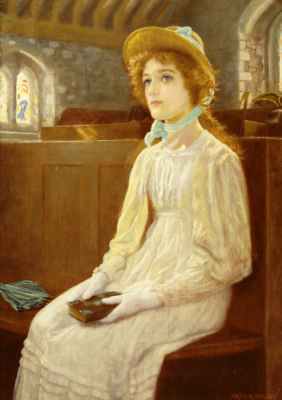 Madox Brown described Annie as 'siren-like'. 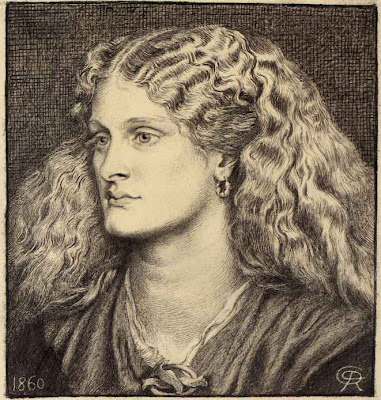 All the artists for whom she modelled, he wrote, were 'mad' about her, and this was certainly true of Rossetti. Indeed he seemed to go out of his way to arouse Hunt's jealousy by taking Annie to Bertolini's restaurant, Cremorne Gardens, and other dubious resorts. The affair would cause a permanent rift between the two Pre-Raphaelite Brothers. Anxious not to cause any misunderstanding with Hunt, Boyce called on him that evening to tell him of Annie's visit and inform him that he intended to ask her to sit to him 'instead of to any stranger.' Hunt agreed it was the best course, and 'the interview was friendly throughout'. Within a week Annie was sitting again to Boyce, 'looking more beautiful than ever,' and Rossetti was joining him to make a 'pencil study of her', now in the Birmingham Art Gallery (Surtees 355). Several more sittings are noted in the diary, after one of which, in March 1860, Boyce lent his model a copy of Wuthering Heights, evidence that her education, however neglected and patchy, was not negligible. Annie made her last appearance in the diary on 16 June 1862 when Boyce saw her at the International Exhibition, 'looking as handsome as ever, (and) walking with a young man, rather a swell'. 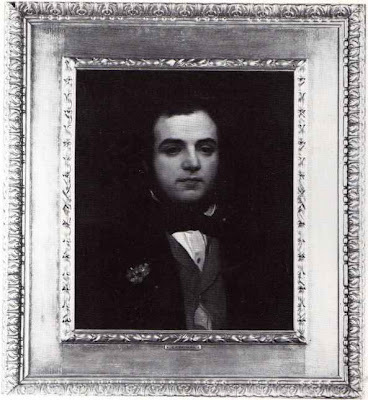 This was probably Thomas Ranelagh Thomson, the first cousin of a former lover, whom she married the following year. Long afterwards, Hunt was to meet her accidentally, 'a buxom matron with a carriage full of children, on Richmond Hill.' They stopped and talked, discovered that they were both now happily married, and Hunt admitted to himself that, traumatic as their relationship had seemed at the time, he could now forgive Annie's 'offence'. Our handsome drawing is dated 1860 and must have been made not long after Annie began sitting again to Rossetti and Boyce at the end of the previous year. It shows her at the age of twenty-five, not twenty-one as the inscription indicates ('aetat XXI'). This suggests that she had lied to Rossetti about her age, perhaps in her anxiety to resume her career as a model. 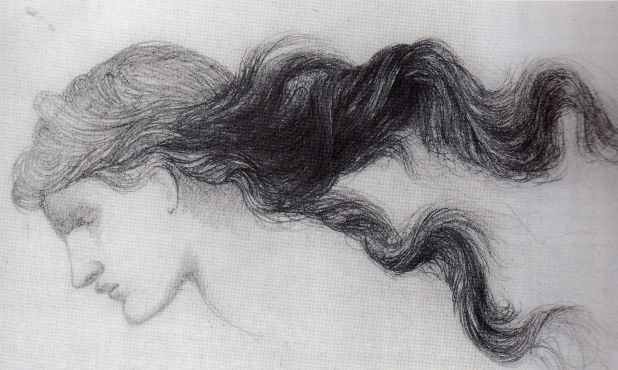 The drawing belonged to the artist L.S. 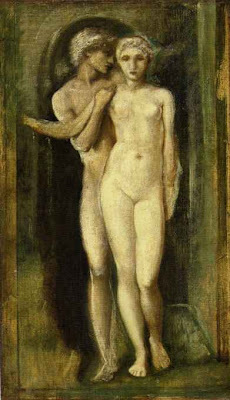 Lowry (1887-1976), a passionate devotee of Rossetti, and is not the first of the Pre-Raphaelite's works with this provenance to grace these Rooms. 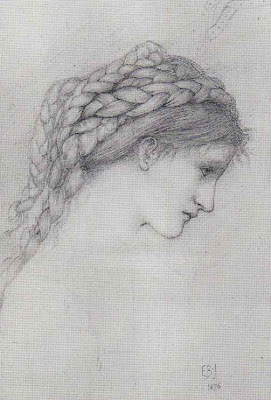 The 1877 version of Proserpine (private collection) was sold on 27 November 1987 (lot 140), making saleroom history by becoming the first Victorian picture to realise more than £1 million, and Pandora, a magnificent red chalk drawing of 1869, which still holds the world record price for a Victorian work on paper, followed on 14 June 2000 (lot 14). 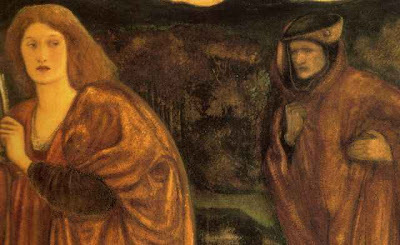 Lowry had acquired them repectively two years before and two years after he bought the present study. 19 1/4 x 13 3/8"
Daughter of Charles Robert Prinsep (Advocate-General of Calcutta). 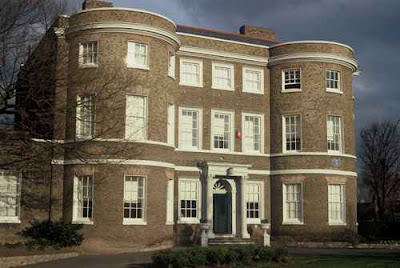 She lived for some years at Little Holland House (where Watts also resided) and she sat for him, and her cousin Val Prinsep. She married Andrew Hitchens, and after his death Hallam, 2nd Lord Tennyson in 1918. The father was an important patron of Watts and he painted a series of portraits of the family, mainly now in the Ionides Collection at the V&A. This was offered for auction in 1981.